• High cooling capacity for this category, at 130W TDP. • Four 6mm heat pipes with aluminum caps carry heat to cooling fins for high performance. • Nine blade silence-optimized 120mm be quiet! PWM fan with high-quality sleeve bearing is optimized for quietness and supports the best balance of cooling performance and silent operation. • Even at 100% PWM function, noise is a scant 26.8dB(A). • High resolution multimedia systems. • Advanced gaming. 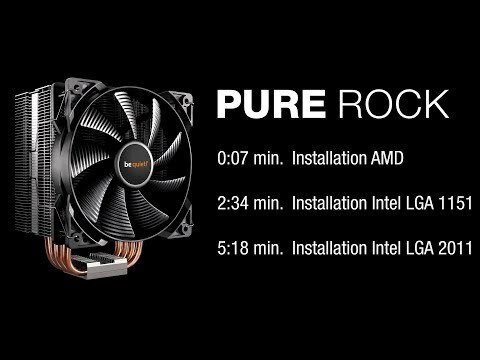 Features • High 130W TDP cooling efficiency. • Mounting kit which allows assembly from atop the mainboard. • A silence-optimized, nine blade, 120mm be quiet! fan. be quiet! 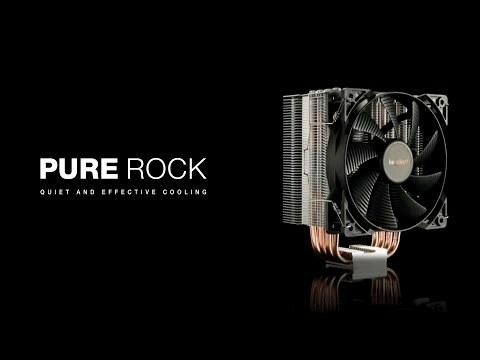 Pure Rock Compact Single Tower CPU Cooler, 4 Heatpipes, 1x120mm Silence-Optimised PWM Fan, 130W TDP, Intel/AMD is rated 4.7 out of 5 by 18. Rated 5 out of 5 by Illy01 from Fantastic value I've had this for more than 2 years now and I can still get my CPU to idle at 20 degrees. The only thing you need to be careful of is that it's very tall so measure first, but other than that amazing value for money. Rated 5 out of 5 by Wreford from Very Quiet Cooling Fitted this fan and heat sink to my AMD processor which had the AMD supplied fan running flat out in the hot weather and making lots of noise. My PC is in a full size case and the side cover just touches the heat sink but closes without problems. The bag of hardware looked rather formidable but the AMD only required two metal strips and four screws. Other items were options for various types of Intel processor. Heat sink compound was already applied to the mounting surface. Very pleased with the quietness and doubt the fan ever ramps up to full speed now as the heat sink seems pretty efficient in itself. Rated 5 out of 5 by EdgeOfPain from Ultra quiet cooler. This cooler has a fan with high quality bearings so it's very quiet. The mounting system is a bit tricky on the AM4 socket but it's extremely solid. Rated 5 out of 5 by Jwatkins456 from Great product, once you work out how to assemble it! Really great, replaced a much larger previous cooler. Very effective and quiet. Look up on the internet how to install the fan, the instructions are no good but once you work out how it goes on, the mechanism is actually very helpful. Really great product, will use beQuiet a lot more in the future! Rated 4 out of 5 by Valkyrie from Stylish Leaves a very nice look in the build. Lines up well does its job and the setup is easy once your decrypy the instruction manual sent with it. The metal heatsink itself bends very easily So reapplying the fan in a diffrent position will add a new permanent bend in the heatsink so you got to make sure you line the fan up exactly were you want it the first time. Rated 5 out of 5 by pudyj from brilliant purchased this to cool my i7 6700k was previously using a seidon 120 water cooling kit wich is terrible by the way.but im very pleased with this its quite and looks great in case if you have a windowed case and more importantly keeps my cpu nice and cool.after running prime 95 stress test for 20 minutes highest temp reached was 75c and thats with an overclock to 4.4ghz and prime being very heavy test bench so would never normaly putt my computer through that much strain anyway so very impressed.Only little niggle i have is theres no antivibration mounts for the fan to mount to heat sink but not a major deal would highly recomend this product. And great service from Scan as usual. Does this CPU cooler come with thermal compound? My product arrived with thermal compound pre-applied, which performs quite well. Can you fit a second fan on the other side? The mounting mechanism used by the cooler allows for the fan to be mounted on either side, therefore if your motherboard has the space and you can get hold of another mounting mechanism, then yes. But straight out of the box, I could only see one set of clamps for the fan. Is this Cooler compatible with Ryzen sockets out of the box? I&rsquo;m using it on an AM4, straight out of the box with no extra fittings. The setup is slightly confusing but with patience the instructions can help you work it out. The product information states that it supports quite a few intel and and sockets, if yours is on there then I would say, given the large amount of mounting equipment in the box I didn&rsquo;t use, it is.